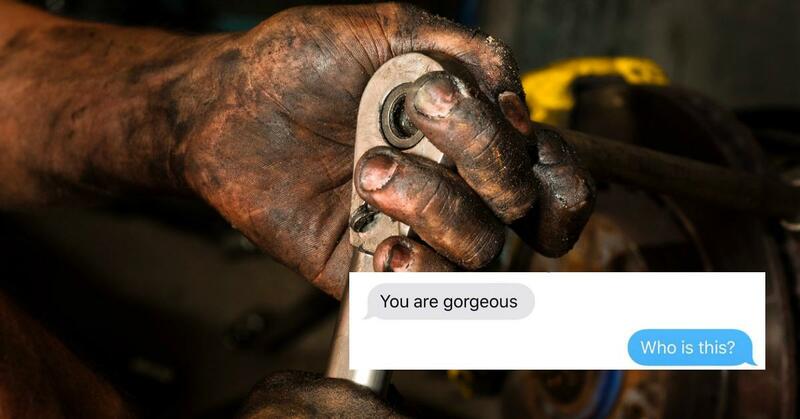 Woman Turns Inappropriate Text From Jiffy Lube Guy Into a "Teachable Moment"
Matters of the heart are difficult, especially in modern times. Since everyone's packing a smartphone these days with a variety of messaging and social media apps to choose from, if you come across someone that tickles your fancy, creeping on them is all too easy. 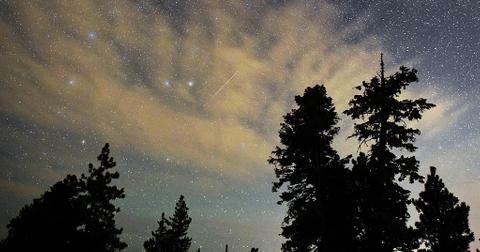 But even the most avid internet stalkers usually know there's a line you don't cross. Looking at someone's public photos and checking their statuses is one level, and I'd argue most people are guilty of this. The next level is DMing or messaging someone out of the blue on one of these social media platforms. If they don't respond, you cut your losses and move on, or never get over it and decide love is dead for you forever. A bit extreme, but hey, it's your life and you can do what you want. Then there are people who cross the line and get a hold of someone's phone number and then text them out of nowhere. That's when things get uber-creepy. It's bad enough when they get your number from a friend and hit you up, but it's even worse when they go to more extreme lengths. 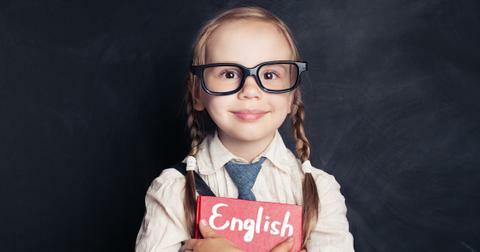 Like, let's say, by accessing your customer account information at an auto body shop. 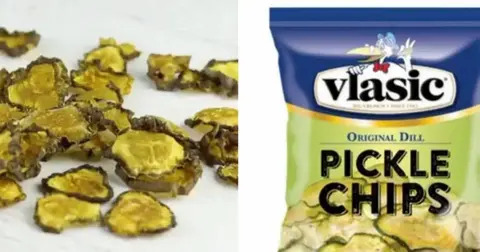 Twitter user @LovableAndKind's sister experienced that top-level creepiness when she brought her car in for service and interacted with a Jiffy Lube employee. He was so smitten with her, he thought it'd be a good idea to grab her number from the system, plug it into his cellphone, and send her a text telling her how beautiful she is. Not a romantic gesture by any means, especially considering the nature of their relationship. 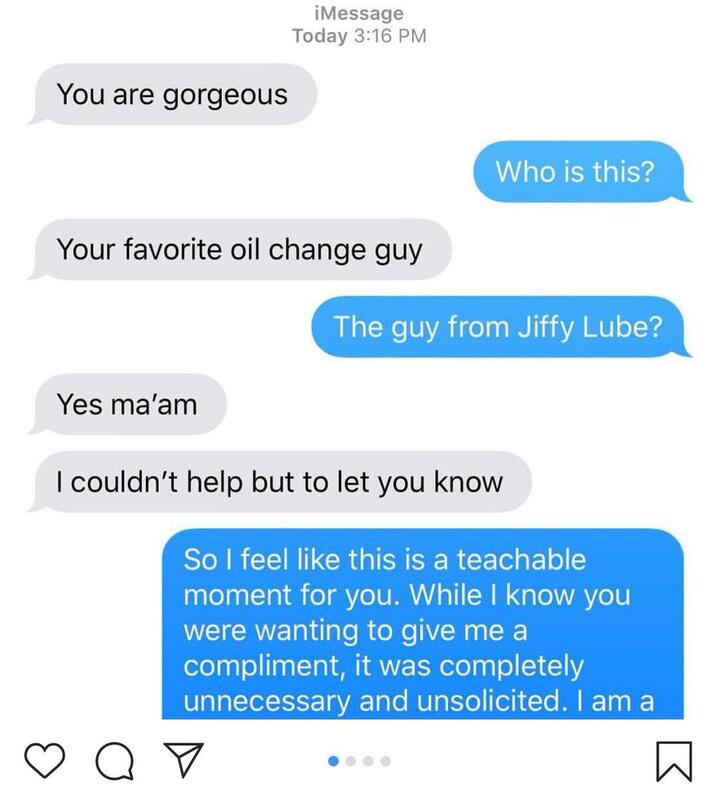 The "gorgeous" woman in question certainly wasn't complimented by the Jiffy Lube guy's comment, in fact, she was understandably creeped out by it. 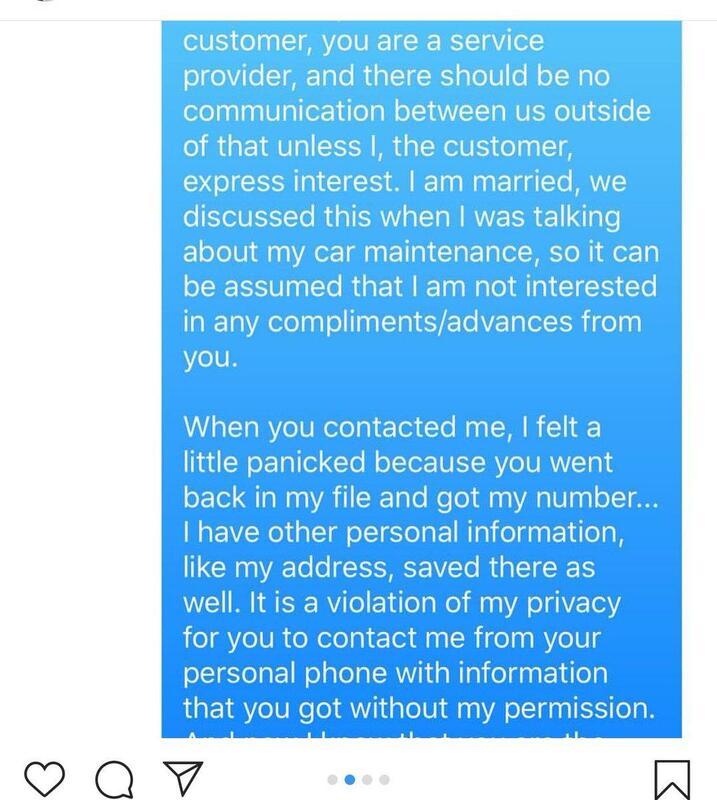 But instead of just blocking the number and reporting the dude to corporate, she decided to take a different approach: thoroughly delineate why his text was such a bad, bad idea, and explain to him, in great detail, why he should never do that again. She didn't mince words, either. 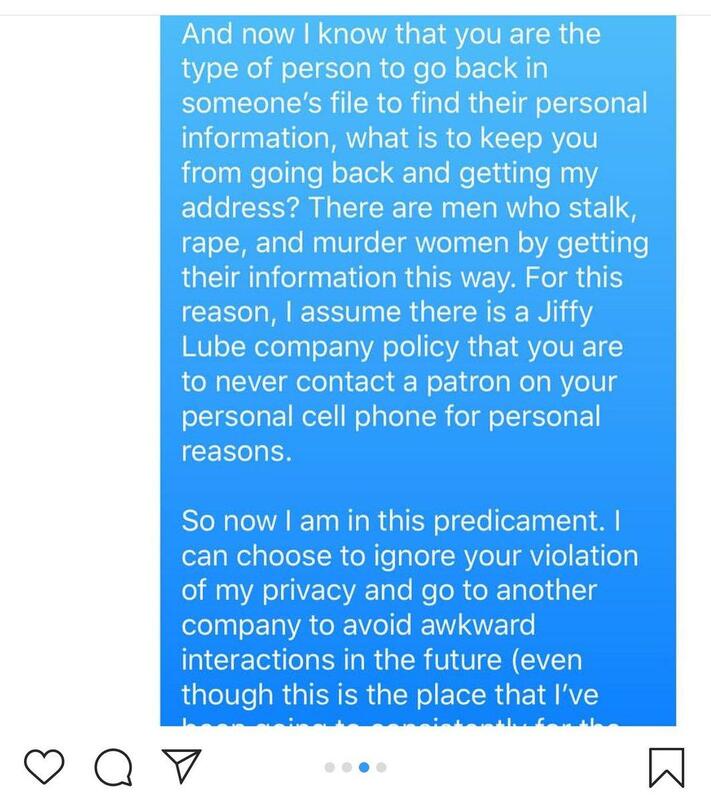 She clearly states just how wrong and scary his move was, that the type of guy who takes customer data from a corporate database to text a customer could snowball into the type of obsessive behavior where a person shows up at the object of their affection's house or work out of the blue. At the end of her righteous tirade, it looks like her message got through. 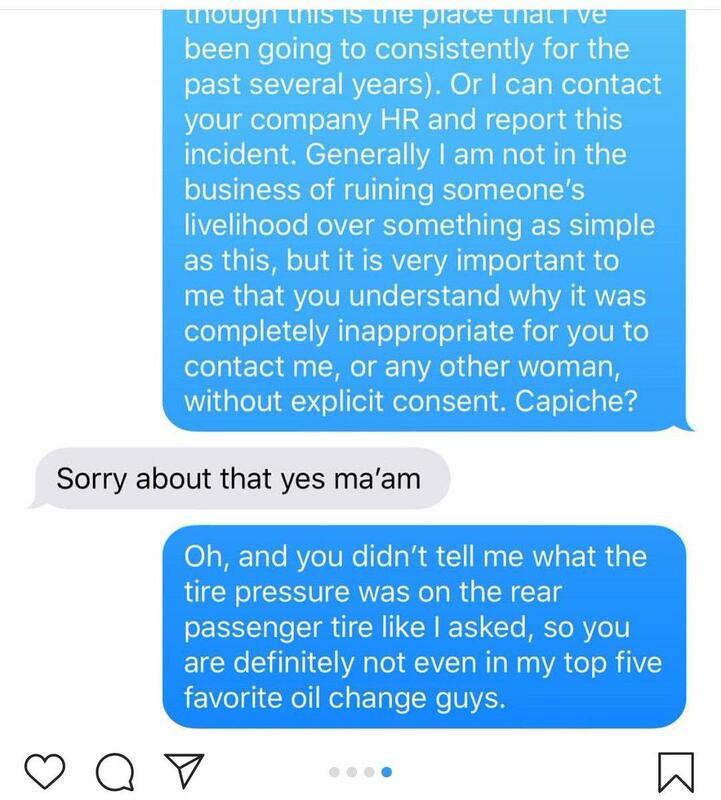 Other people chimed in, stating that they too were creeped on by Jiffy Lube guys, but I'd argue that it's a problem with any business that asks for a customer's phone number. Jiffy Lube's official account apologized, which started a Twitter brigade asking them to stop requiring people hand over their digits to get their car serviced. If I had a busy auto garage, I'd definitely want customers' phone numbers, because I'd want the fastest way to contact them in case an emergency popped up or their car is done and I need to make room for other vehicles. Maybe just stress to your workers during onboarding that being a total creepazoid is not cool and that there's a zero-tolerance policy for any of that nonsense? I'm sure there is already though, and don't know if a stern warning is enough to stop someone who's capable of doing this, from doing what the Jiffy Lube guy above did in the first place.